Blogger Social has been Moved! Breaking News! 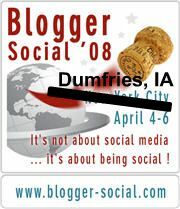 It’s late notice, and hopefully no-one will be inconvenienced, but…the upcoming Blogger Social this weekend has had to be moved, to Dumfries, Iowa. Mayor Bloomberg of NYC has called an emergency meeting of the New York State Ethics committee to investigate the past lifestyle choices of every single legislator in the state and city, and all hotel rooms in the City had to be confiscated in order to accommodate a massive influx of private investigators, panicky public figures, and drooling lawyers. The Iowa Blogger Cabal (IBC), led by Drew McMillan and Mike Sandstone, graciously suggested that Iowa would be a good central point for hosting the meeting, and on short notice, the Knights Inn of Dumfries had sufficient room for 80+ bloggers. There is a Cracker Barrel and White Castle right nearby on the town strip for dining choices, and just around the corner is a the PineBox derby championship track, for exciting touring possibilities. Chuck’s Rent-a-Wreck has special weekend discounts on compact cars as well. Just change your flights to connect through Chicago, then on to Council Bluffs, Iowa, then hitchhike or jump a train to Dumfries (warning: trains don’t actually stop there, so you’ll have to jump at that grassy section right near the crossing next to the Sarah Potter elementary school). 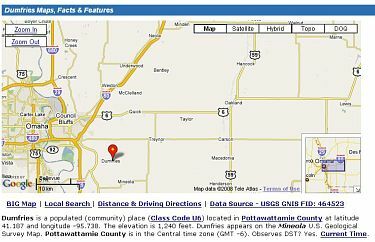 Dumfries is located in booming Pottawattamie County and is sure to provide a wealth of social and networking opportunities throughout the weekend. 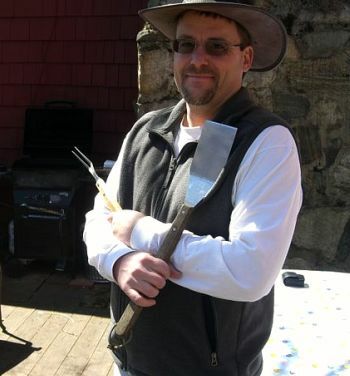 For those still determined to do a Sunday afternoon barbecue, the legendary Steve “StickyFigure” Woodruff (picture here – and, hey, you can STILL sign up!) will be renting a BS ’08 LearJet for the quick hop from Dumfries to Northern NJ. See you there soon…oh, and Happy April 1st! A year or so ago, I contributed to a group-authored book (with 102 others!) 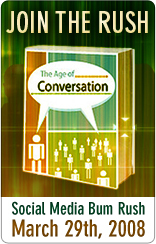 called Age of Conversation. It’s all about social media and the new marketing – full of fascinating gems and insights. Learn more here. Cheapskate that I am, I bought the e-book version. But today I finally broke down and bought the REAL hold-in-your-hand version. And you can, too! The proceeds for this book go to Variety, the Children’s Charity. Please go to Amazon using this link and buy your copy today! On rare occasions, I’ll comment on political matters – typically, not to make a political statement, but to note how certain events have a “branding” twist to them. 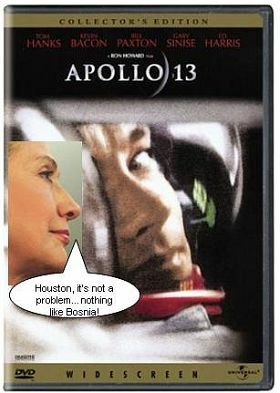 Brand Hillary just lost the moon. The juxtaposition of her fantasy-like description of dodging sniper bullets with the pictures and descriptions of the reality of the event have put, in my mind, the final nail in the coffin of her damaged image. How can any reasonable person respect someone who plays so fast-and-loose with the truth? Or feel confident in their leadership? Companies that do that lose their chance to make the landing in our hearts, because it’s a trust thing. When you begin to conclude that a person or a company will say or do anything to achieve power or influence, you have to shake your head and walk away. Nope. This is not her finest moment. Really, folks, how many events do you go to where you get, not one, not two…but THREE attendee guides? You already know about the “official” bios put together by Arun and his team. But now, in quite an extensive labor of love, Jennifer Berk has assembled the entire Blogger Socialite series of profiles…and in 2 formats, including a handy-dandy booklet size. You can download these .pdf files right here. Below, one final publication of the attendee roster and the links to their profiles. What a great job – thanks, Jennifer, for your generosity. And while we’re talking about generosity, some of you may have found out via Twitter that Todd Andrlik‘s sister was just diagnosed with an aggressive form of breast cancer, and will have to undergo a bilateral mastectomy this weekend. The (social media-fueled) outpouring of support has already begun and let us continue it. 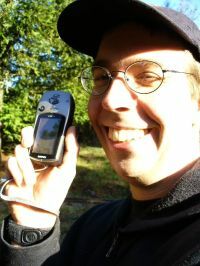 Todd quickly set up a website for Tricia to keep everyone up to date here. He has also posted on his blog here. I saw a press release about the new (free) web-based photo-editing service being made available by Adobe – Photoshop Express. I do a fair amount of low-level image editing for my blogging efforts, so decided to sign up and give it a test drive. When you hear the word “blogger,” what comes to mind? Some geeky, reserved person hunched over a computer, anonymously tossing out fatuous opinions for no-one to read? Not! At least, not the marketing-type bloggers I virtually hang with. In fact, 80+ of them are coming from around the world (literally) to socialize face-to-face at the upcoming Blogger Social in NYC (April 4-6). – Backyard barbecue at my place, being organized by…well, me. The best way to indicate your interest is to go to the BS’08 Meetup Board and sign up. I’m sure you can contact the organizers directly if that’s easier for you (please do so ASAP, so we can plan properly). Collaboration. Creativity. Volunteerism. Socializing. Welcome to blogging the way it ought to be! I can’t believe it! We finally got through the whole list of attendees for the upcoming Blogger Social in NYC – this is the last batch of profiles! The “master post” with the entire list of links for these profiles can be found here. Also, Arun Rajagopal (and supporting cast) has put together the “official” set of brief bios and pictures (yes, this set of Blogger Socialites profiles is actually a bootleg version!) here, which is fabulously done. However, since that document can’t possibly contain all the fascinating information for such a stunning-looking group, Jennifer Berk is putting together a print-able version of this bootleg set of profiles, and that will be available for download very shortly as well. In her own words, Tamar writes, “I love learning how websites work, the social communities that surround them, the news and hype surrounding websites (especially search engines! ), and I especially love administering the servers upon which they reside.” You can learn lots more about her here. 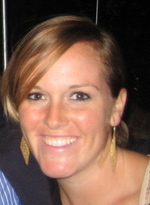 And of course, you can see what she’s up to at Twitter, Flickr, and LinkedIn. We look forward to meeting you Tamar! CB is all about flooring the consumer. So much so, that her blog bears that very same name. If you’re not a regular reader, you should certainly stop by and have a look at her plethora of in-depth articles about marketing, retail, and of course – flooring! As Director, In-Store Innovation for Solutia’s Wear-Dated carpet fiber, I track consumer trends and am fascinated with digital and brick/mortar retailers who are passionate about meeting the needs of their consumers. My educational background includes a BA in Art History from Smith College, an MBA in Marketing from Columbia Business School, and constantly studying the world around me! Kaitlyn’s blog (Catch Up Lady) covers everything from social media to politics to comedy to music to…you guessed it – ketchup. Kaitlyn’s writing is alive, intriguing and fun. She interjects some sarcasm, humor, and a little satire into many of her posts, and it makes for quite a good read. The Catch Up Lady is me, Kaitlyn Wilkins, a 27 year old ketchup aficionado. Raised in Ann Arbor, I have lived on the east coast for the last eight years – which means I both drink pop, and pop my collar. 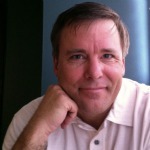 I am currently a Digital Influence Strategist with Ogilvy Public Relations Worldwide in Washington, DC. Prior to that, I was a Project Manager with New Media Strategies, an online brand management and word of mouth marketing firm. I am a graduate of Wellesley College. Last but not least, we’ve arrived at the man, the myth, the legend – Mr. Steve Woodruff. He is the inspiration, sweat, blood and tears behind this entire “Blogger Profiles” operation. And he also happens to blog right here at StickyFigure. 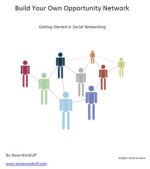 His writing is practical, informative, strategic and engaging. And it can even be a little challenging at times (which is a good thing). If you couldn’t gather from this massive labor of love, Steve is an incredibly generous guy with a passion for helping others. 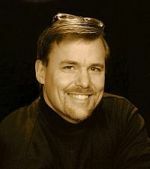 He’s a contributor at the Small Business Branding blog, the author of the Marketing Bloggers Portal (using the PageFlakes tool), a collaborator on The Branding Wire, and the founder and president of Impactivti, a firm that focuses on pharmaceutical sales training. 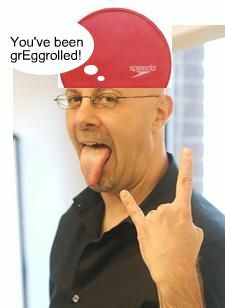 If you want more in-depth on this mythical figure, Steve has a historical ramble on his rarely-updated personal blog. 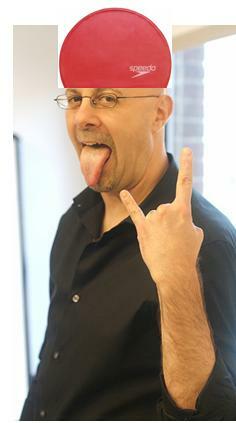 Steve Twitters (a recent convert), does LinkedIn, and occasionally drops in at Facebook.